The Rebel Sweetheart. 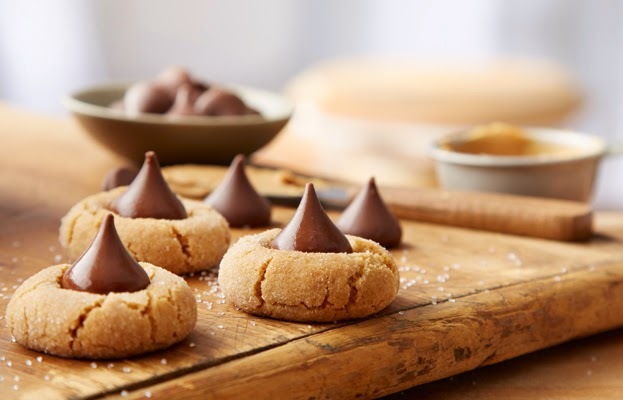 : Foodie Goodie | Peanut Butter Blossoms. Aside from tofu, there is another food that will always have a special place in my heart stomach. Lol. It's peanut butter. Reese's Creamy Peanut Butter, to be exact. Even my son loves it too, so I make there's always a jar in stock at home. Aside from being a bread spread, here's another way to enjoy Reese's Peanut Butter. And it comes together another all-time favorite - Hershey's Kisses! 2. In large bowl, combine the flour, 1/2 cup sugar, brown sugar, baking soda, salt, butter, peanut butter, milk, vanilla and egg. 3. Mix with electric mixer on low speed until stiff dough forms. 4. Shape dough into 1-inch balls then roll them in sugar. 5. Place 2 inches apart on ungreased cookie sheets. 6. Bake at 375°F for 10 to 12 minutes or until golden brown. 7. Immediately top each cookie with 1 Hershey's Kisses, pressing down firmly so the cookie cracks around edge. 8. Remove from cookie sheets and cool completely. These are cute. I can like this a lot. My ex husbands mom used to make these all the time. I have not made them in years. I will have to try making this recipe for sure. Thanks for sharing. This is perfect with tea! Yummy! Yummy, these look amazing. They resemble a cookie that my mom used to make. I don't think they had peanut butter in them. But she did make some good peanut butter cookies. I love peanut butter cookies. These look fantastic! !